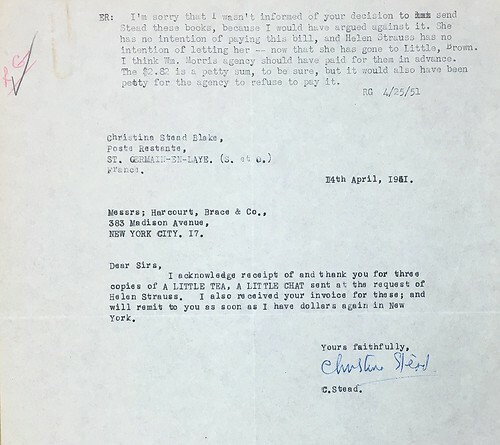 Today we look at correspondence between Harcourt, Brace & Co. and Christina Stead as one of the many examples within our Robert Giroux Papers illustrating the behind-the-scenes world of the publishing industry. Robert Giroux (1914-2008) was an award-winning American editor who worked for Harcourt, Brace & Co. and Farrar, Straus & Giroux, Inc., where he was a vice president, partner (as of 1963), editor-in-chief, director, and chairperson of the board of editors. Christina Stead (1902-1983) was an Australian writer of short stories and novels and is considered one of Australia’s greatest writers and is most well-known for her novel The Man Who Loved Children (1940). 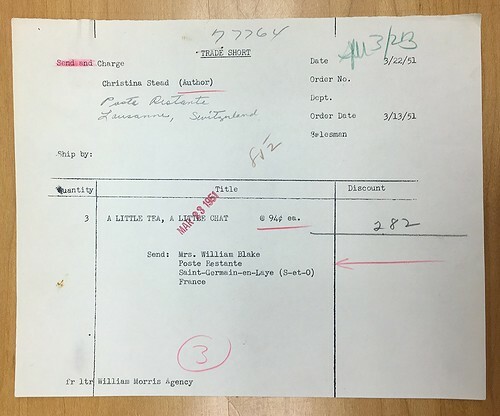 The correspondence featured here concerns her book A Little Tea, A Little Chat (1948), a story of an middle aged American scoundrel during World War II who seduces and betrays women. 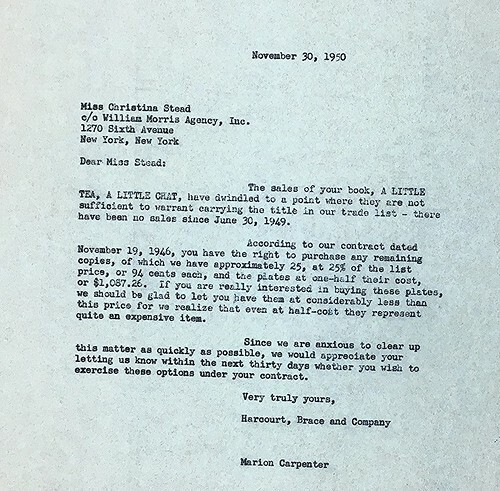 In the correspondence we find that the book’s sales have dwindled and Harcourt, Brace & Co. are offering her both the remaining copies and the plates from which the book was struck at a discount. This is only a taste of what will prove to be an exciting research collection. This collection’s status is currently in processing, but is available for research with an appointment at the Special Collections & Archives in Monroe Library at Loyola University New Orleans, M-F 9:00-4:30. Here is a little something extra! 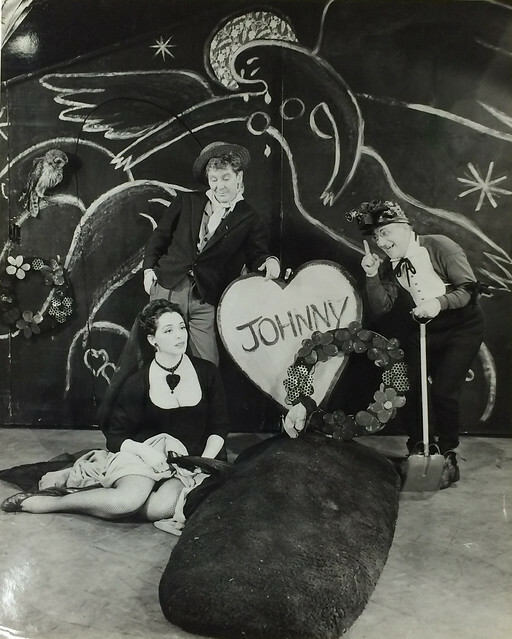 A program about Christina Stead from Radio National: The Character And Situation Of Christina Stead. 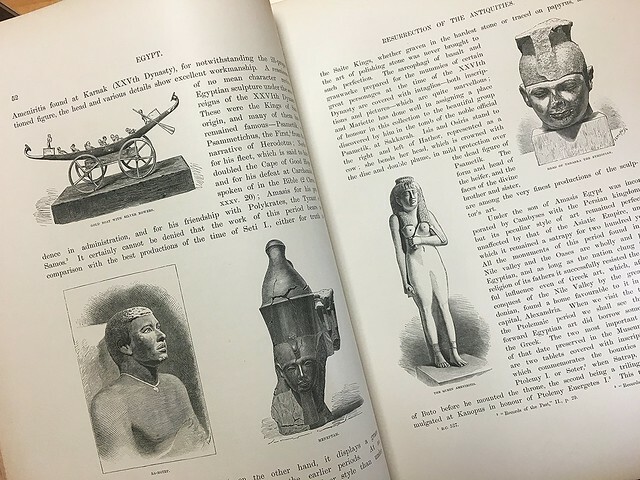 Today we take a look at volume 2 of a 2 volume set Egypt: Descriptive, Historical, and Picturesque. We are sharing with you the 2nd volume, since volume 1 is much more fragile. 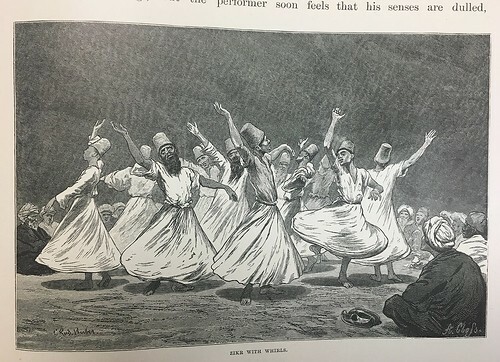 Luckily it has been digitized and is available via Rice University’s The Travelers in the Middle East Archive (TIMEA) and through the Internet Archive. This book was compiled and written by Professor George Mortiz Ebers and translated by Clara Bell. 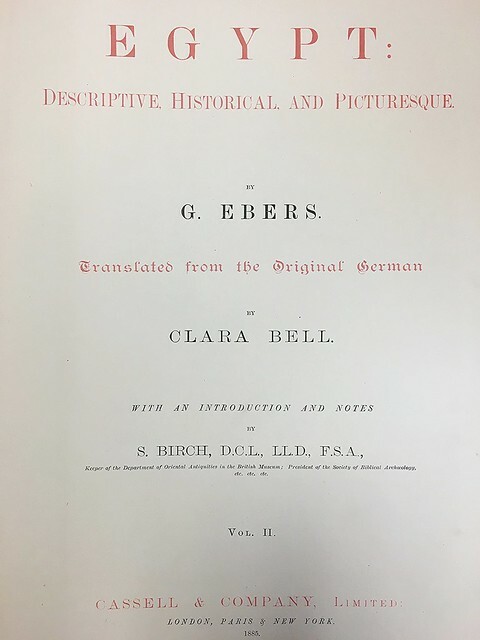 Ebers was a German Egyptologist and writer (1837 –1898). 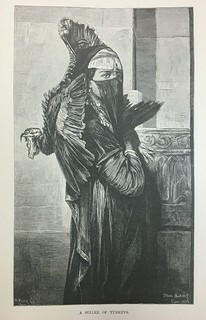 Clara Bell (1834–1927) was a translator best know for her translation of the 90-volume work The Human Comedy by Honoré de Balzac. 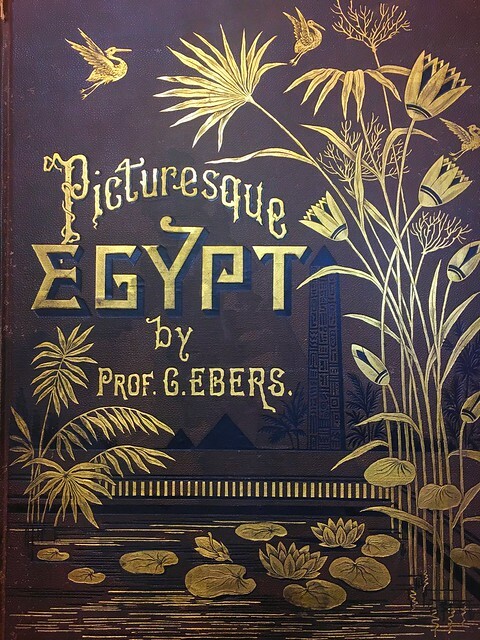 Heavily illustrated, with over 400 images, with gilt edges. It is a large book at 387 pages and measuring 12 1/4″ x 15″ making the digitization of it a joy not only of access but for its ease of use. 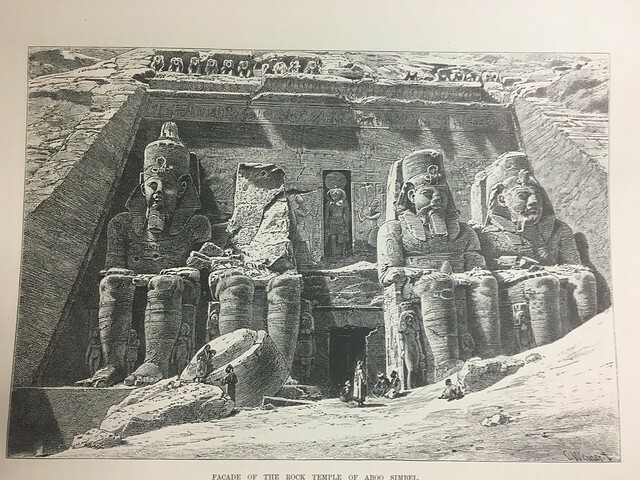 Today we offer you a selection of images (all of the artists are credited at the front of each volume) from the book with corresponding links to modern images, additional information, and locations of the sites. Located here. Also, a modern day image of the temple. It is an UNESCO World Heritage Site. 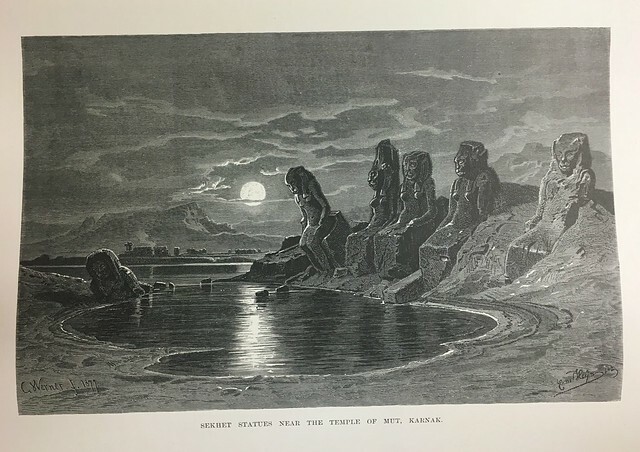 Image of Sekhmet statues near the Temple of Mut in Karnak, located here. 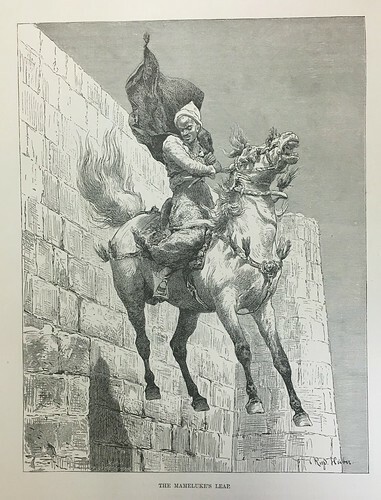 Come check out this or one of our other rare books housed in the Special Collections & Archives at Monroe Library Loyola University New Orleans, M-F 9-4:30. 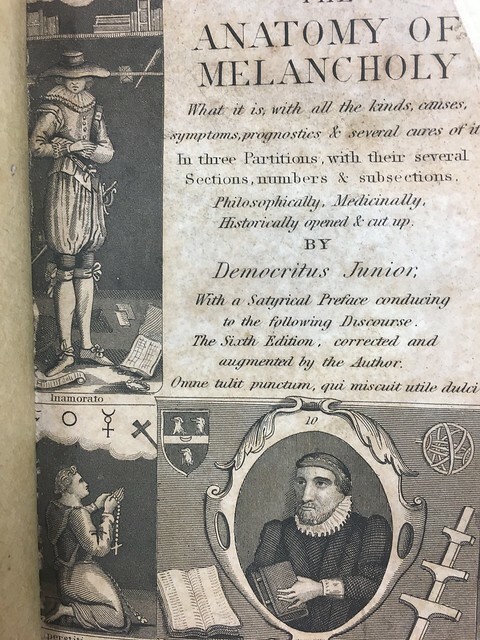 First published in 1621, The Anatomy of Melancholy was subsequently repeatedly expanded by its author Robert Burton (an Oxford don who also worked in the Oxford Library) 6 more times during his lifetime. His work in the library is informative in that The Anatomy of Melancholy is a book of many books, filled with citations, quotations, and interpretations of various specialists. Robert Burton is pictured (above) holding a book. Burton, as described in A Short Biographical Dictionary of English Literature, was “subject to depression of spirits” and wrote the book as an “antidote” for his own melancholy. 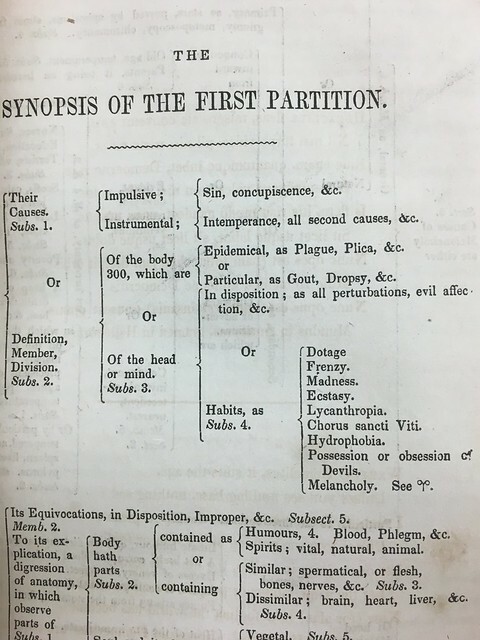 A su generis work that covers much more territory than to just anatomize melancholy (though it is a dissection of it), it is a book that seeks to explain human emotions, and is a compendia of printed knowledge and science of the time. The book is rooted in the dominate Greek Medicine theory of Humoralism. Within this theory, melancholy (clinical depression) is attributed to black bile, one of the Four Humors. Galen of Pergamon theories on the Humoral System of medicine influenced Western medicine for over a century. 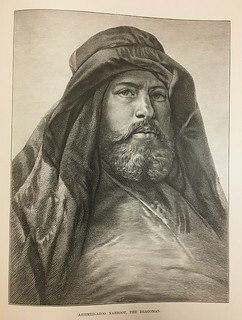 His theory of the Four Humors consisted of a holistic system that drew upon the Platonic philosophy of the relationship between the mind and the body. These fluids ran all through the body and where all thought to be present in the blood. For instance, if you poured a person’s blood into a glass, it would (theoretically) separate into these four fluids. These fluids and their corresponding temperaments (mind-body connections) need to be in balance for health, while disease occurs when they are out of balance. Treatments like blood letting, purging, vomiting, and food sought to bring the humors back into equilibrium. Burton wrote, and rewrote, The Anatomy of Melancholy as a treatment for his own struggles with depression. The fact that he revised and expanded the work with six published editions is a testament to his obsessiveness regarding the process and the need to “write of melancholy by being busy to avoid melancholy”. 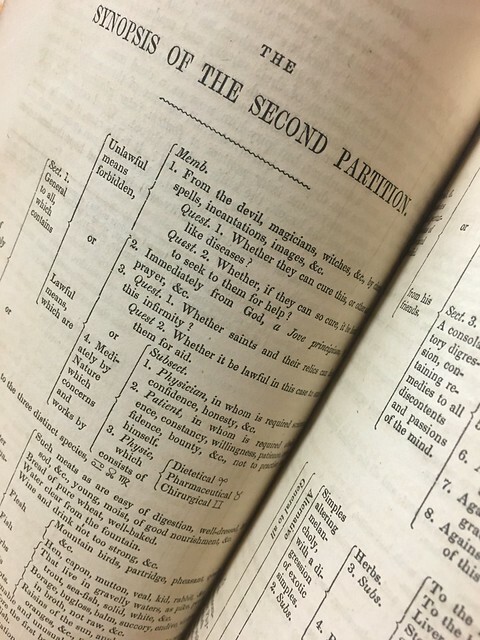 We have two different editions here in the Special Collections and Archives and you can also find it online in full-text. 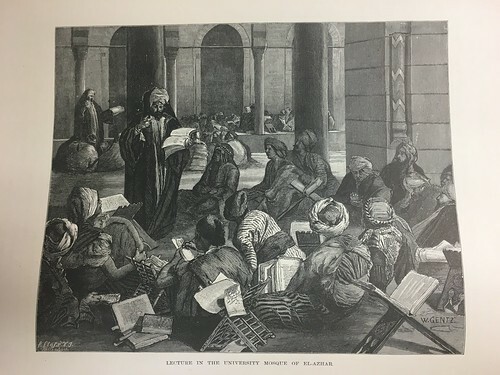 It is a fascinating book that is satirical and serious and of a time when scholars wrote and read across the disciplines of science, medicine, and philosophy. And here’s a little something extra: A BBC Radio IN OUR TIME broadcast on the book. Today all of New Orleans is abuzz with excitement. The day that locals, tourists, and jazz enthusiasts alike have all been (rather impatiently) waiting for has finally arrived, and the entrance gates of the New Orleans Fair Grounds are spread wide to welcome us to the New Orleans Jazz & Heritage Festival! 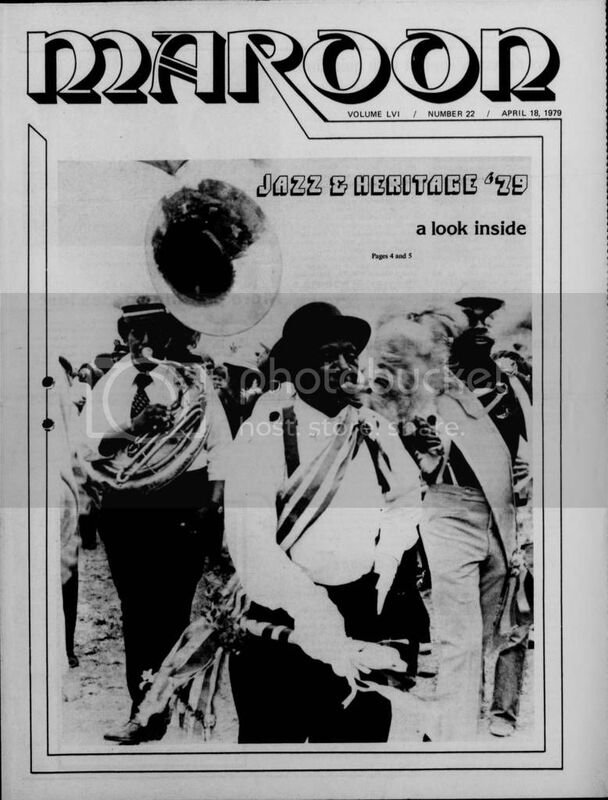 The 1970 New Orleans Jazz & Heritage Festival brought together the likes of Mahalia Jackson, Duke Ellington, Pete Fountain, Al Hirt, Clifton Chenier, Fats Domino, The Meters, The Preservation Hall Band, parades every day with The Olympia Brass Band and Mardi Gras Indians among others. 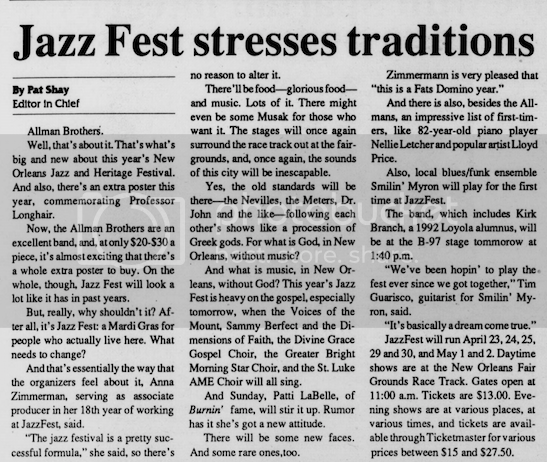 Although only 350 people attended the first “Jazz Fest,” the festival quickly developed into a cultural event synonymous with the spirit of New Orleans. 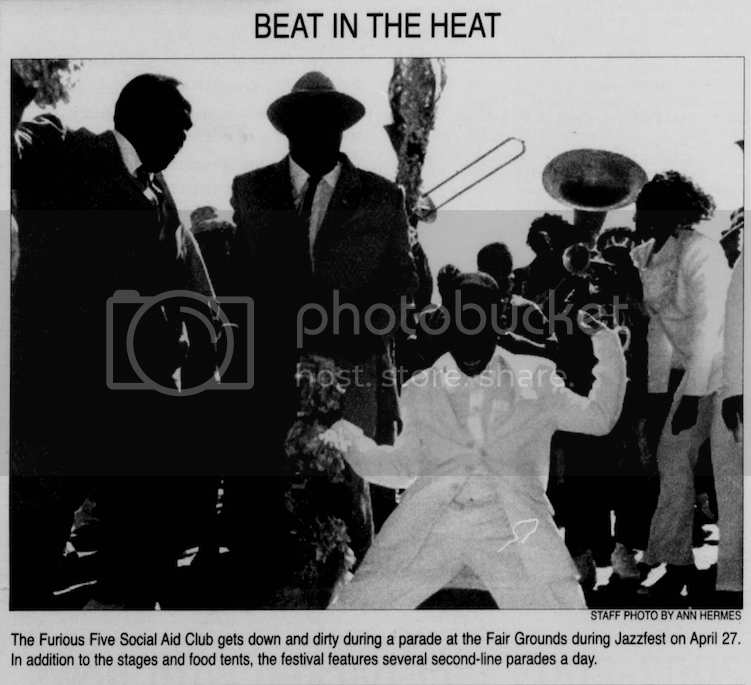 By 1972, the event had outgrown the confines of Congo Square and relocated to the New Orleans Fair Grounds (the 3rd oldest racetrack in the United States). Two years later, the festival introduced its first limited-edition silkscreen poster, now produced annually and recognized as the most popular poster series in the world. 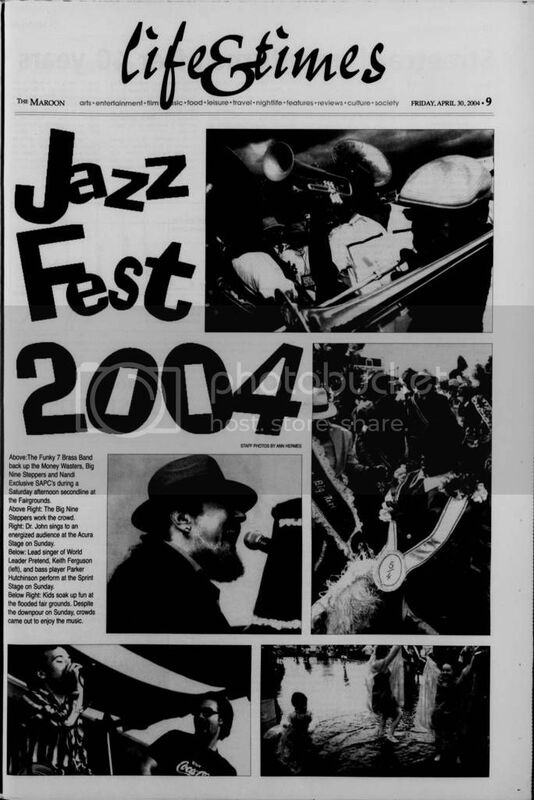 The 1990′s saw the popularity and significance of Jazz Fest soar–the New York Times would write that the festival had “become inseparable from the culture it presents,” and in 2001, the Jazz Fest celebrated the centennial of Louis Armstrong with a total of over 650,000 attendees. Happy Jazz Fest, Wolf Pack! Check out our digital archive of the school newspaper, the Loyola University Maroon, here. Knowledge of the World consists of 200 loose-leaf artist cards featuring color reproductions of work produced by prolific Ivorian artist Frédéric Bruly Bouabré (c. 1923-2014). The interview aired last Friday, April 15. We’re always excited to find out who is using our collections–thanks to the Graham Norton Show for reaching out to us! A television broadcasting legend in New Orleans, Phil Johnson worked for nearly 40 years at the city’s top-ranked CBS affiliate, WWL-TV. 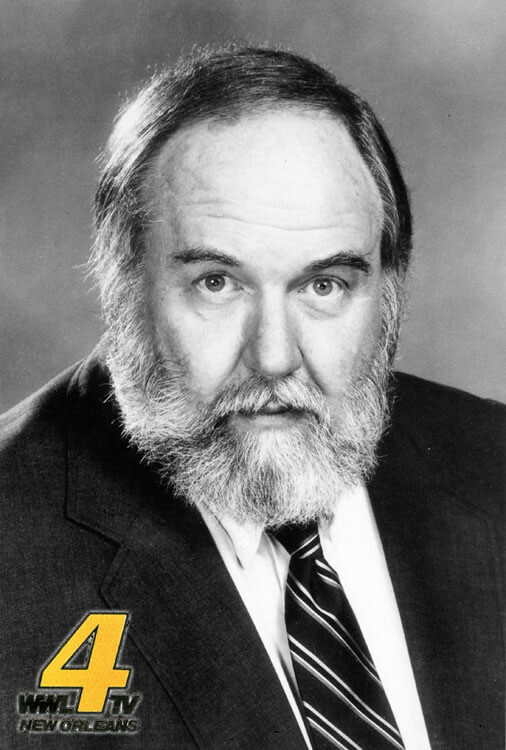 During his career, he served as promotion director, documentary producer, news directors, assistant general manager, and editorialist. Johnson retired from WWL-TV in 1999. A graduate of New Orleans’ Jesuit High School (1946) and Loyola University (1950), Johnson began his journalism career at the now defunct Item newspaper. 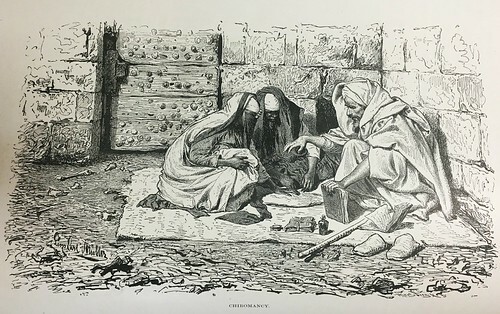 His print experience also included a brief stint in print journalism in Chicago, and a prestigious Neiman Fellowship at Harvard University in 1959. He would return home, at the dawn of the local television era, taking a position as promotion director at WWL-TV in 1960, just three years after the station signed on the air. As a professional communicator Johnson received countless honors and awards. His writing and narration of television documentaries earned him an Emmy and three George Foster Peabody Awards: in 1970, for a documentary called “Israel: The New Frontier;” in 1972, for “China ’72: A Hole in the Bamboo Curtain,” which featured footage filmed by the first non-network American news team allowed into the Communist nation in almost 25 years; and in 1982, for “The Search for Alexander.” Johnson also served as a war correspondent, reporting for the station from Vietnam, Beirut and Israel. New Orleans viewers may know him best for the 10,000 broadcast editorials he produced throughout his tenure as editorialist at WWL-TV, presenting the station’s editorial opinion on local, state and national topics from 1962 to 1999. In 1997, Johnson was named to the New Orleans Broadcasting Hall of Fame and merited a Lifetime Achievement Award from his peers in the Press Club of New Orleans. The editorials in this collection were authored by Phil Johnson during his long career at WWL-TV and aired on the station as a regular nightly presentation from March, 1962 through July, 1999. Following his retirement Johnson returned to deliver infrequent editorials at Christmas, and on the occasion of a colleague’s death. WWL-TV was established by Loyola University New Orleans in 1957 and owned by the university until 1990. The collection chronicles the 36-year political history of New Orleans and Louisiana from 1962-1999. All editorials were written and delivered by Johnson unless otherwise noted in the index. Please refer to the index key of designations. A native of New Orleans, Marguerite Piazza graduated from Loyola University with a bachelor’s degree in music in June 1940. She then attended graduate school in music at Louisiana State University. 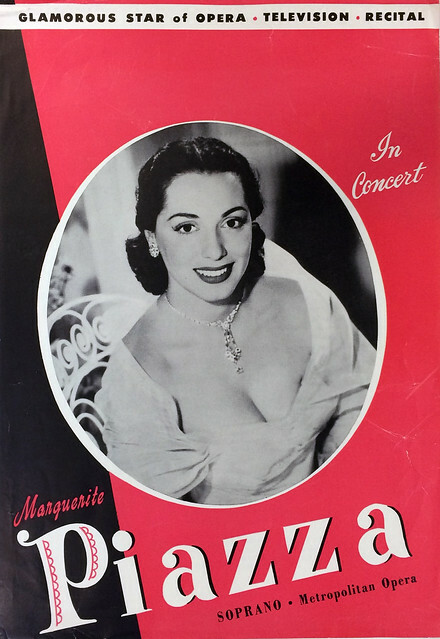 Following university study, Piazza began her career as a professional singer. 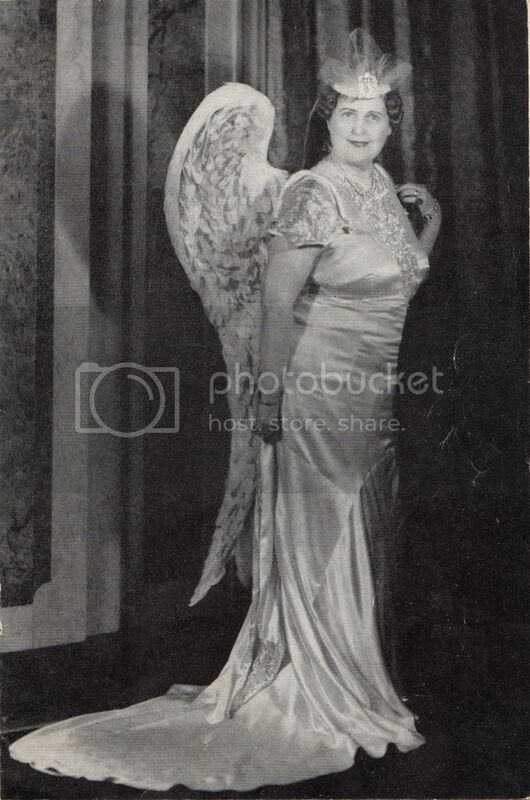 Much of her early work, roughly from the mid-1940s to the early 1950s, was as an opera soprano. Her performances included stints with the New York City Opera and with the Metropolitan Opera Company. Afterwards she performed in television, especially on NBC’s Show of Shows, in theater, night clubs, and in other forms of entertainment. 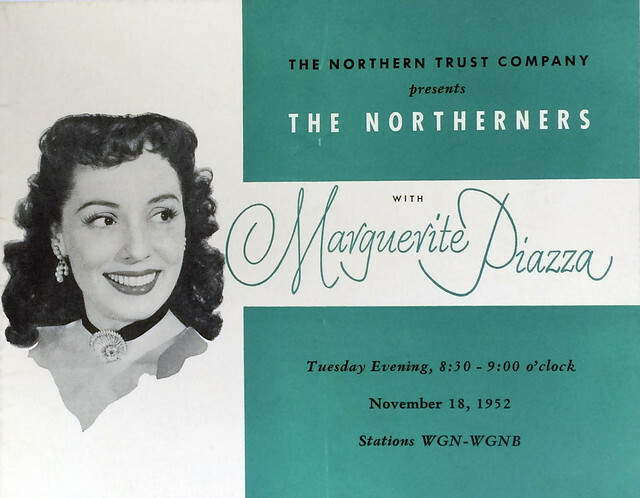 The Marguerite Piazza Papers roughly cover the years 1939 and 1974, with the majority of content from 1945-1960. They are arranged into two series based on types of material: Programs and Playbills and Photographs. Each series is then arranged chronologically. 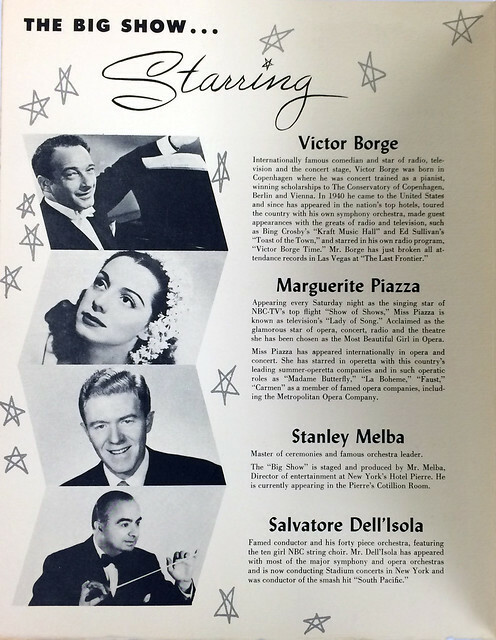 These programs and photographs document Marguerite Piazza’s singing career throughout the United States in operas, musicals, television, nightclubs, and other performance venues. Click here to view the full finding aid for the Marguerite Piazza Papers. 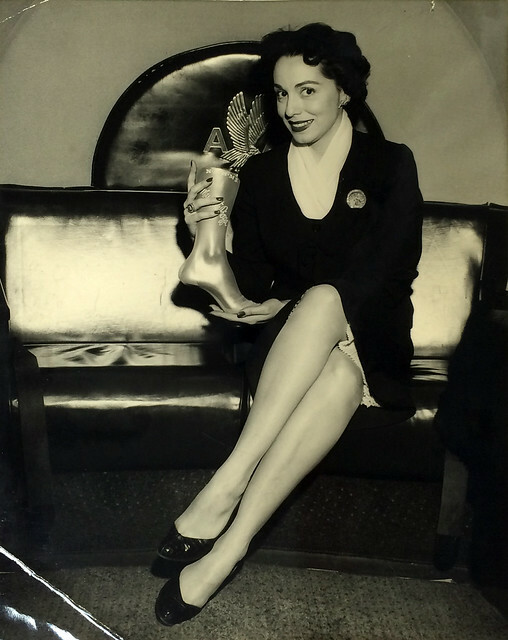 Piazza aboard American Airlines flight to Memphis after receiving the "Golden Stocking Award" from the hosiery industry for having the most glamorous legs in American, 1956. 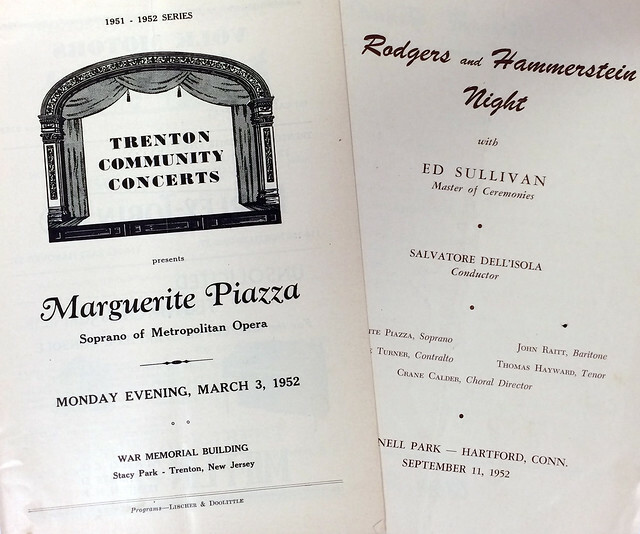 The Marguerite Piazza Papers are available for research in the Booth-Bricker Reading Room in Monroe Library’s Special Collections & Archives Monday through Friday from 9:00 AM till 4:30 PM. 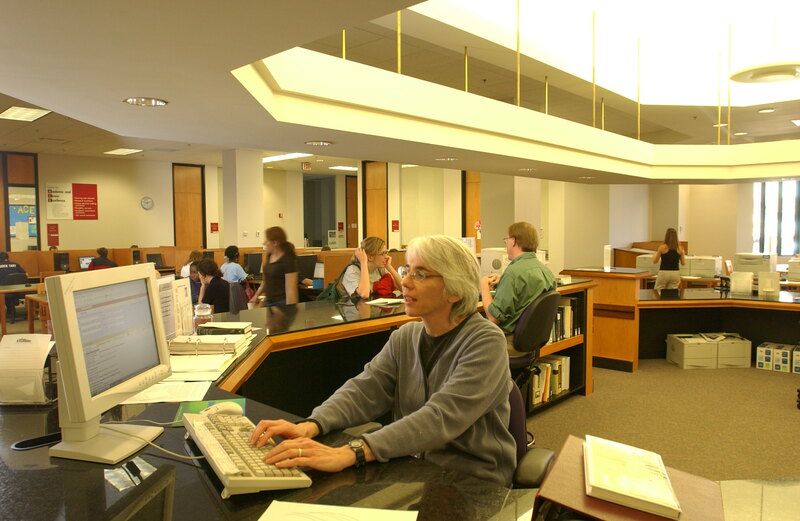 It’s National Library Week, and in Special Collections we’re taking a cue from our colleagues at the Othmer Library and using the theme of Transforming Libraries to show how our library buildings have transformed. 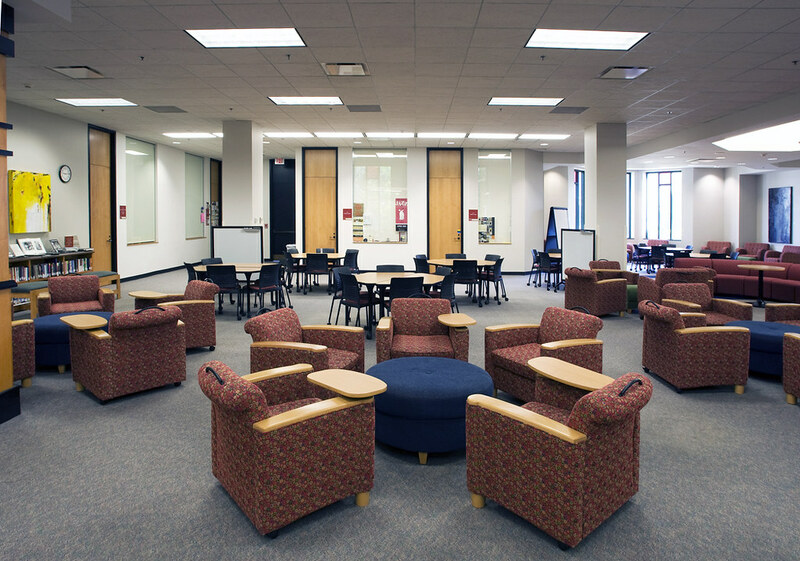 For starters, the first library on campus was the Bobet Library in Marquette Hall. Groundbreaking ceremonies commenced in November 1996 for the new J. Edgar and Louise S. Monroe Library by co-chairs of the capital campaign, Adelaide Wisdom Benjamin and Michael J. Rapier. Other university and community dignitaries assisted in the ceremony. Construction began that month, and continued through completion of the building in October 1998. Library faculty and staff worked with Covan movers to transport the collection from the Main Library to the Monroe Library. 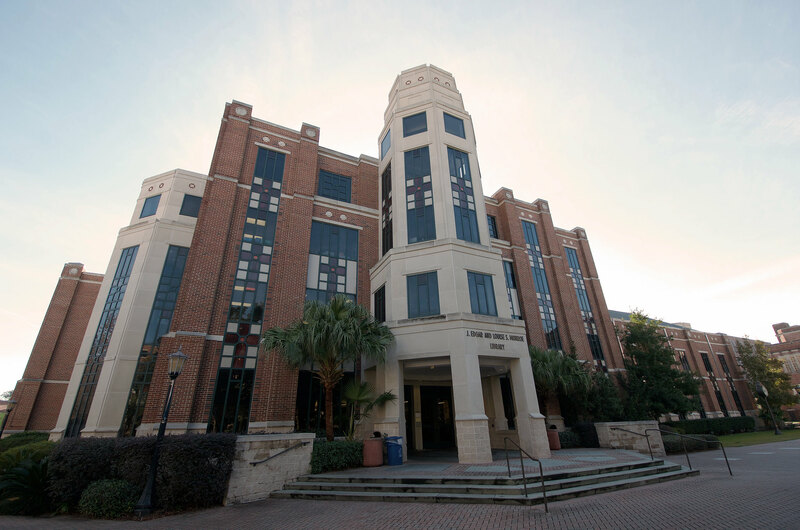 The new J. Edgar and Louise S. Monroe Library opened its doors for patrons on January 11, 1999. More information about the library’s history can be found in our new Loyola University New Orleans Library History Collection. 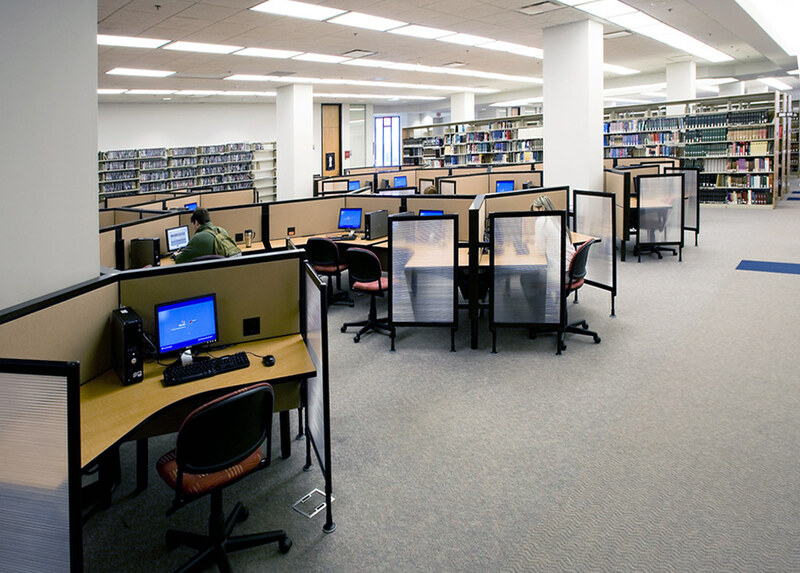 How have libraries transformed YOU? SGA Elections were last week. While you anxiously await the results, enjoy these images of Loyola students voting in the 1950s. 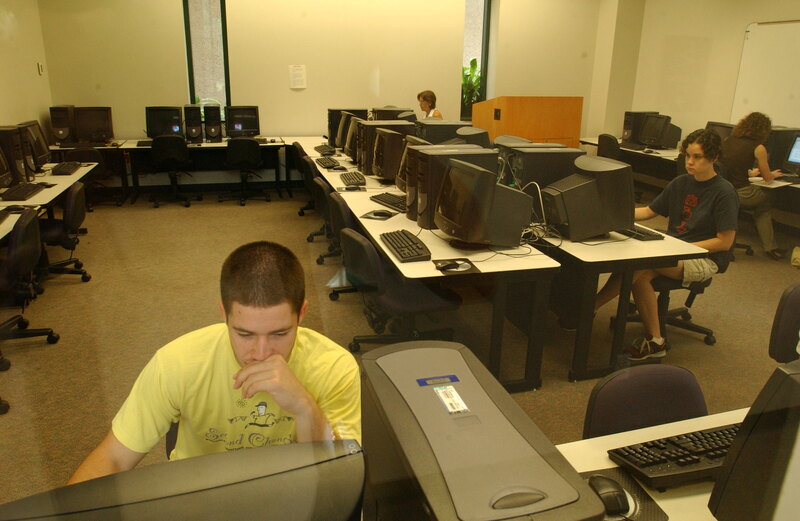 These photos and more can be found in the University Photographs Collection in the Louisiana Digital Library. You are currently browsing the Library Lagniappe blog archives for April, 2016.